Looking for private in-home or in-studio Tuba lessons? Our Duluth teachers are ready to get you started. Find your teacher today! Check out some of our most popular teachers near Duluth, GA including Atlanta, Marietta, Decatur, Alpharetta and Smyrna. I teach absolute beginners, intermediate and advanced students. I work with them on technique, strong fundamentals, sound production and the repertoire of band and orchestra music. Since moving to Colorado in 2004 John has performed with all major arts organizations including Colorado Symphony, Colorado Ballet, Central City Opera. Before moving here he was in the San Francisco Bay area for many years with positions including Second Trumpet in San Jose Symphony and Principal Trumpet in California Symphony for eighteen seasons. As well he did numerous national tours and recordings with the San Francisco Symphony and San Francisco Opera. He taught 5th and 6th grade band in Los Altos schools and maintains an active private studio. Beginner - Learn how to read music and have a good technical grasp of tonguing and phrasing. Intermediate - Prepare to learn pieces of music and play in ensembles. Advanced - learn orchestral performance and solo performance techniques on a high level. I am a current band director focused on your student's mastery and success on the tuba. We will work on tone, range, and develop technique through a tailored lesson that will fit you or your student. I am also happy to supplement your child's band instruction and work on area/region honor band auditions with your child. I have been teaching privately tuba/euphonium and chamber music lessons for the past 9 years. I have had students in the Ohio All - State Band and Orchestra and many students who continue to major in music in college in conservatories across the US. I use my experience as a performer and teacher of many styles of music to help adapt my lessons for the individual students learning style. I am a professional tuba player from Cleveland Ohio. I am currently principal tuba with The Orchestra Now in upstate NY. I received my B.M. from Baldwin Wallace University and my M.M. for the San Francisco Conservatory of Music both in Tuba Performance. I have performed as a guest artist with some of the worlds top ensembles including; The Cleveland Orchestra, The San Francisco Symphony, The Fresno Philharmonic, The Stockton Symphony, The Akron Symphony and the New World Symphony. I am also an experienced teacher, I have taught students in OH, MI, and CA. I have had students in the OMEA All-State Band and Orchestra, and many students go on to be successful music majors in conservatories across the US. I really enjoy and take pride in teaching. 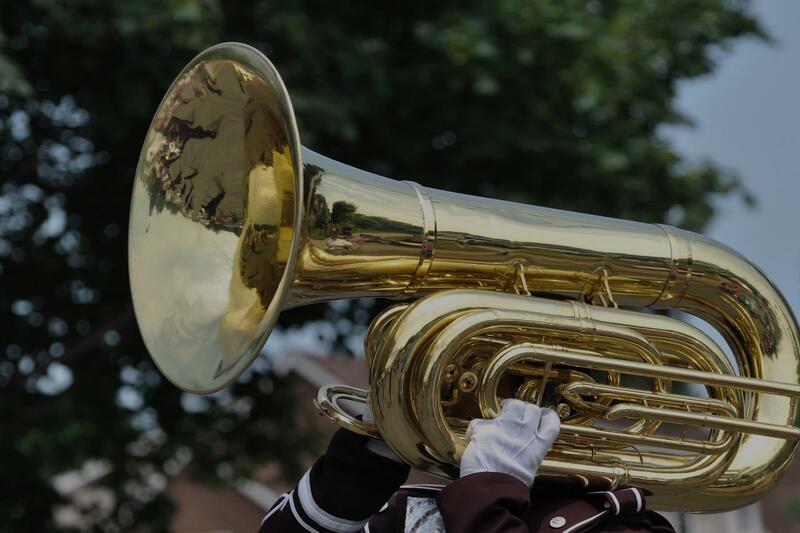 Whether you are just starting out with tuba or already ten years in, this package allows you to connect with an instructor who can assess where you’re at and establish a trajectory to help you reach your goals. You may focus on learning a few pieces or just specific techniques. Either way, you’re sure to end the package feeling more competent and confident in your abilities. This lesson package can be repeated as needed. Played in Army Band from 1993-2006. Ability to teach to both Mississippi Lion's Band and Louisiana All State requirements. The concept is simple: empowerment to generate mastery on your instrument. I like to work with you at your level, from beginner and up. My goal is to not only help you understand the mechanics of the instrument, but to empower you to create as limitlessly as possible on it. I will be working with you on things such as rhythm, ear training, embouchre development, breath control, sight reading, understanding musical notation and terminology and beyond through a few of my own and others' techniques. I have eight years of experience with the tuba. During my high school career, I was consistently selected to participate in the top honors ensembles. As a student at UNC-Greensboro, I study tuba performance and play in the School of Music's top ensembles (the Symphony Orchestra and the Wind Ensemble). During lessons with me, students will learn how to refine technical skills and how to interpret music by being encouraged to think about what lies beyond what is printed on the page. My name is Justin Bare and I'm currently working on a Bachelor's Degree in Tuba Performance from the University of North Carolina at Greensboro. In addition to the tuba, I play trombone, euphonium, and ukulele. I take joy in sharing the knowledge that I've gained over the years with other people who have the same interests and passions as I do. Can't find a teacher in Duluth, GA?